Whether you’ve got a new ad on TV, an exciting product launch or are just starting to get that festive feeling every eCommerce retailer knows just how exciting, and how stressful, peak periods can be. The question is how do you maintain a high level of service and meet customer expectations so that you can make the most of your busiest time? Our new whitepaper shares expert insight on how to ensure you’re able to step up to the challenge. Having extra traffic to your site can be exhilarating, but you want it to be an adrenaline rush for the right reasons. An eCommerce strategy and infrastructure are created specifically to cope with peak periods is vital to achieving this. To make a success of a peak period, you need to make sure that you’ve considered every angle and have a robust plan in place in order to stay on top of your game; from having a supporting marketing strategy and sufficient stock, to ensuring your site’s technologies and infrastructure can cope with the surge in traffic. We recently spoke to five eCommerce experts including David Pert, eCommerce Director at Simon Jersey; Lauren Percival, eCommerce Manager at Forever Unique; Phil Turner, eCommerce Manager at Silentnight; Sam Rutley, Digital Director at PushON and UKFast’s own eCommerce Team for their insights and tips. First we asked them about their key concerns in the lead up to peak periods. So, how can retailers prepare for that period to ensure they can flourish during the festive period? He, like Lauren, also sees the value in taking a broader view on how customers are accessing your offering – desktop is, if not over, then definitely not top dog anymore. 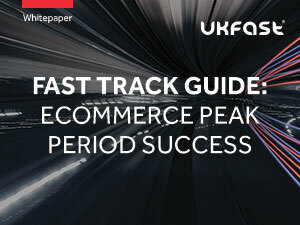 Hear more about preparing for the peak periods, including making sure you have the infrastructure to support your needs, in our whitepaper the Fast Track Guide to eCommerce Peak Period Success.